Animated video is an engaging medium that is cost-effective and easy to manage. It has all the benefits of being a visual medium without requiring huge resources. With animated videos, you can let your imagination run wild because you can bring any concept to life. With animation, you can slide scales and bend the laws of nature at will. If you can picture it, you can do it. No matter how complex or out of this world the concept may be, you can bring it to life. Animated video allows you to construct a context for complex ideas and bring them to life no matter how impossible they may seem. For instance, we humans cannot escape the reality of gravity, but an animated character can and does. Animated characters perform impossible acts easily but a good animation must make the impossible actions believable. Animated video also allows you to tackle complex, often difficult subject matter without causing your audience to go into defense mode. You can capture abstract ideas. If you can point a camera at it, then live action might be best, but what if you need to capture something big like global logistics or something very, very small like the workings of a microprocessor? Or something abstract like Bitcoin? Ideas that are difficult to represent can be more easily portrayed and thus understood using animated video. Internet users tend towards short attention spans, spending short amounts of time on videos or articles. Animation is evocative and sparks conversation, but it also does it fast! An animated video evokes emotions that resonate with viewers making them want to follow the story. There is so much advertising in today’s world that much of it has become white noise. Animation can cut through the gray of so much internet marketing and grab attention. Cartoons are fun. Most of us remember them from childhood. Animation pushes the nostalgia button in all of us, making us more likely to watch an animated video. In fact, nostalgia marketing is fast becoming increasingly popular. Couple a sense of nostalgia with the fun of an animated video and you may have a powerful combination for attracting attention, eliciting shares, and developing opportunities to interact with your customers and potential customers. A major advantage of using animation for social media channels is that it is can be less expensive than live video production. Video production requires actors, location-scouting, lighting, shooting, editing, and post-production. Creating an animated video can cost a fraction of the cost of an equivalent live video. And it is much easier to update than live video content! Editing animated videos allows you to change text, edit animations or completely overhaul the entire video for a fraction of the cost that live video reworking requires. Animated videos a great choice for any business, but smaller companies with limited marketing budgets should be paying particular attention. Video storytelling is a powerful marketing tool. 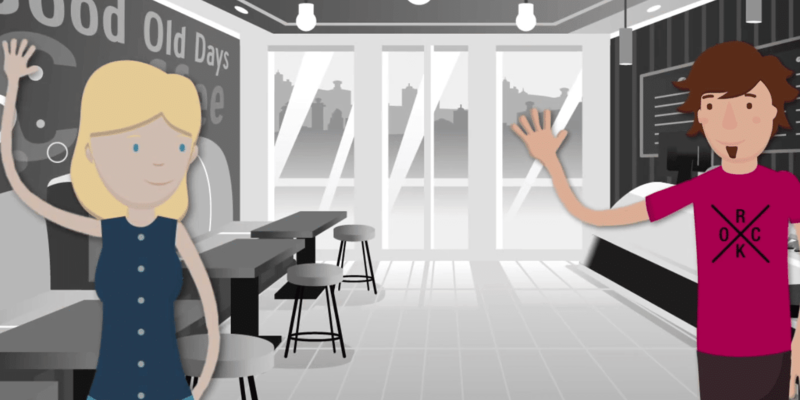 Animated videos are finding their way into many marketing strategies. More and more businesses are enjoying experimenting with different types of videos on different media channels. With animated video, it is easy to experiment with different channels to see what works best where. YouTube, Facebook, and Twitter are all examples of sites on which video content is popular, but any marketer needs to be aware of the different audiences, demands, and styles of the various social networks. A combination of animated videos and live action videos may be the best solution for your brand. Whatever way you choose to tell your stories, remember that 65% of the population are visual learners and that visual information is processed 60,000 times faster than text. As a video creator, whether animated or not, you need to grab people’s attention in the first frame. Since many people mute sound while browsing social sites, the video must be visually compelling and able to convey its message without sound. Thankfully, videography professionals know how to make every element of a video compelling and work for your brand. To learn more about animated videos and how this style of storytelling can help boost your brand, get in touch with our dynamic and friendly team at 949-233-0613 or info@digipulse.com.